Roman Catholicism: Original Christianity or a Development? ...Thomas saith unto Him, 'My Lord and my God..."
ἀπεκρίθη Θωμᾶς καὶ εἶπεν αὐτῷ· Ὁ κύριός μου καὶ ὁ θεός μου. I would give all the world to have a faith like that! Examine Yourself! Are You in the Faith? If that's in the Bible, I'm lost! HELL - will a loving God punish lost sinners? How much does sin weigh? Is there any hope for ungodly people? Featured Conversion - what is it? Featured LIBERTY: Who gets it and how? Featured Personal Words From God ? Featured PEACE: Is it yours? If not, why not? Martin Luther - Here I stand! Behavior for Believers: Is it right to do this or that - to go here or there? How can we enjoy heaven when we know our loved ones are in hell? Can an individual interpret the Bible? Muslims object: How can God die? What is the believer's "rule" of life? Sinai or Calvary? Exposing Error: Is it worthwhile? Does the Church go through the Tribulation? Are you a member? And of what? What Church should I "Join" ? What is NT Church pattern? Why not women leaders in the local church? I try, but cannot understand the Bible. Was a bone of Jesus broken? Is God immoral for commanding the extermination of the Canaanites? Is the Church under the New Covenant? What does this verse mean to me? Angels that sinned. What was their sin? Dead to the Law - Antinomian? Evil - What is it, and where does it come from? Holy Spirit: Force, Impersonal Power, or God? Protestant Reformation - our roots? When the Lord said no, in Mark's gospel. ¿Choque Cultural En El Rapto? ¿CUÁL ES LA REGLA DE VIDA PARA EL CREYENTE? Goodnight or Goodbye? - Buenas Noches o Adiós? Which Church Saves? ¿Cual Iglesia Puede Salvarnos? 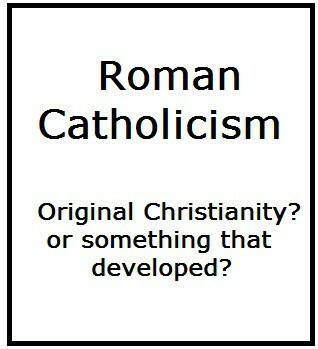 Roman Catholicism: Original Christianity or a Development over the centuries? We often hear the argument, that Roman Catholicism is the original and therefore the only true church of Jesus Christ. Other groups are looked upon as estranged children needing to be brought back into the fold. Protestants and other non Catholics have argued the contrary for centuries...ie... that Roman Catholicism isn't Biblical Christianity. What is the position therefore, of those who deny the assertion of Roman Catholic primacy? The unscriptural priesthood that divides an equal brotherhood into clergy & laity. In practice it de facto denies the true priesthood of all believers, and is in a sense a return to Judaism, with its clerical/priestly class. It disregards the NT priesthood of all believers, and returns it to a special class. That is Judaism. It moved away from scriptural church government (elders, deacons) to the complexity and hierarchy so prevalent in Catholic (and Orthodox) circles. The sacramental system, replace two simple ordinances, The Lords Supper and Believers Baptism. These two even took on new meanings over time. The elevation of Mary and Saints in mediatorial areas, is mindful of the gnostic warnings of Colossians. Rome approves the veneration Mary, Saints, Relics. In practice this lifts these equal to or even above (in practice) Christ as mediator. A doctrine of works and faith for justification, being a merit based system. Baptismal Regeneration is taught as the entrance into the faith, rather than the new birth that comes about by faith in Christ. An utterly unscriptural papacy, the pontifex maximus, which was a title of pagan high priesthood that was never renounced by Rome. Salvation is moreso in Catholicism attained by being faithful to the church and its teachings, than in simple faith in Christ. Justification is by sacraments, works, and faith. The Mass became a mystical rite where a priest was essential in order to turn the elements into the literal Christ at each Mass. Without an unscriptural priesthood there is no unscriptural Mass. The priest becomes essential to salvation in a back door sense, since he is essential with regard to the sacraments which have salvific value. "...of course Rome was the headquarters for the Roman Empire, and Constantine was there. And he’s the one that gave freedom to the church, and he became, really, the first Vicar of Christ, Vicarius Christi—he called himself that—he headed up the church. That’s the Emperor, actually. He called the council of Nicea, gave the opening address, decided who would be there—and so forth. So, there was a dispute—a tug-of-war—for a long time as to who was the chief bishop. And it was not until probably the 800s or 900s before the bishop of Rome managed to finally gain the ascendancy so that everybody had to follow him. That led to the split [in] 1054. Michael Cerularius, who was the patriarch there in Constantinople—he was excommunicated by the pope in Rome over this very doctrine. So you had the split between Rome in the West and Eastern Orthodoxy in the East. But it all involved—a group of men who want to lord it over others, and you have to follow them, and they decide. Now we have a magisterium in the Catholic Church. They began to develop these doctrines. Like the "Infallibility of the pope"—that wasn’t declared until 1852, wasn’t it? The first Vatican Council..."
The title of the pope is "pontifex maximus" This is the pagan high priest title. Christmas and Easter were originally pagan festivals, adopted into Rome. The elevation of particular saints was from paganism. An article on the Cripplegate web site (Pagan saints) quotes Calvin thus: St. Anthony of Padua restores, like Mercury, stolen property; St. Hubert, like Diana, is the patron of sportsmen; St. Cosmas, like Esculapius, that of physicians, etc. In fact, almost every profession and trade, as well as every place, have their especial patron saint, who, like the tutelary divinity of the Pagans, receives particular hours from his or her protégés. Prayers to saints, prayers to the dead, veneration of relics, lighting candles, veneration of icons, and such are also found to have pagan roots. The more that the simple and pure teachings & practices of the New Testament church are encumbered with new practices...then the more that the simpler and original truths are overcome and obscured. The pomp of Catholicism is not hard to see in this criticism. As various new ideas & practices are brought in, the more that the simplicity and Glory of Christ is hidden. Mary is exalted, Saints are sought out, and the One Mediator between God and men, the man Christ Jesus, becomes hidden in the maze. Men begin to look to the saints, the "church", the systems, the sacraments, the priests, the popes...instead of looking to Christ. That which can be "seen" replaces faith alone in Christ alone. The authority of scripture becomes lessened, as the traditions of men become entrenched practices. And then when such tradition found at variance with scripture, the natural argument is that there is "more truth" than just scripture. This of necessity elevated Roman Catholic tradition and 'teaching' to an equality (and we would therefore say a superiority) over the scripture. Because if a contradiction is pointed out, the appeal is always to "the church" and its tradition. "All Scripture is God-Breathed" is a check against this tendency to exalt men. The exaltation of the papal "ex cathedra" pronouncements "from the chair" elevate his word to equality with scripture. This is dangerous from several perspectives, not the least of which is even the acknowledgement by even papists that at least "some" of the popes of history may not have been converted (we would assert "few" or "none" probably were). With these thoughts in view, we would argue that what Roman Catholicism has become... is most certainly not today.... the church of the New Testament. And therefore it is not original Christianity, but was something that developed over time. It may be hard to pinpoint its full apostasy, perhaps at the time of the Reformation, but nevertheless it is far from the original. By apostasy we do not suggest the church of Jesus Christ is apostate, (that is impossible) but that RC is apostate - in the same way a particular local church & its adherents can be apostate. There may be a small number of true believers inside the RC system, but it is in spite of the system, rather than because of it. Mary as mediatrix, elevation of Saints. Many mediators instead of the One. the inquisition, her wars, her persecutions, her denial in history of the Bible to people and her murder of those who did so. Believers are not allowed to interpret the bible for themselves, at least not if it differs from Rome's traditions & teachings. This one is very serious: The Council of Trent Canon 9, which has never been retracted says: "If any one saith, that by faith alone the impious is justified; in such wise as to mean, that nothing else is required to co-operate in order to the obtaining the grace of Justification, and that it is not in any way necessary, that he be prepared and disposed by the movement of his own will; let him be anathema." What this means is that Rome has pronounced their anathema on the gospel of Jesus Christ. Some particular historical matters will now be given with more specificity as we probe the causes and "development" of what today is Roman Catholicism. What are the original seeds that led to what we see today? In the pre Constantine era, the Roman government persecution of Christians especially targeted the leaders (bishops/elders). This seems to have fueled the admiration and elevation of such men (and their position) in the eyes of the "laity". The growth of the clergy/laity distinction (Nicolaitanism) gained momentum thereby. The Edict of Milan 313 AD saw the new "christian" (sic) Emperor Constantine stopping the official persecution of Christianity. There was then a subtle shift from Rome's civil authority toward the authority of religious men. Eventually the bishop of Rome was elevated due to her position in the empire as capital - a natural connection and outgrowth. Before 400 AD Theodosius made Christianity the state religion. This was followed by laws against pagan "worship." The "church" as a governing entity or at least a hearty influence, was on the rise. This terrible development received a death blow perhaps in the principles of the American Revolution with the separation of church & state, and accompanying freedoms of speech & religion. The Council of Chalcedon in the mid fifth century was of importance. Its decrees became underlying causes of what would later divide the Roman and Eastern churches. How? Though it granted the Bishop of Constantinople in the east equal privileges to the Roman Bishop in the west, it maintained the superiority of Rome. This issue would centuries later be a key part of what would divide the eastern and western churches. This took place in 1054, when Pope Leo in the west and Michael Cerularius in the east, excommunicated each other. This was the Great Schism. Today they are called the Orthodox and Roman Catholic churches. Surely one can see in these momentus events, how over time, things developed into what is on display today in Rome. The purpose of this blog is to summarize that which gave rise to Roman Catholicism, and to expose that it is not the same thing as was given by Christ in the beginning. True Christian testimony is not found in the annals of men. The supremacy of Rome throughout the middle ages, led to her dominating the historical records and how history has been viewed. Nevertheless we see from place to place and time to time, surviving accounts of those like the persecuted (by Rome) Albigenses & Waldenses, men who remained separate from Rome, holding to a simpler and more biblical Christianity. For brevity, we do not pursue their histories here except to make the point that the true thread of Christian history is not found in the hierarchy nor historical accounts of that which developed & dominated in Europe. Rather, the true history of Christianity is contained in heaven, where true believers are defined not as being adherents to a particular creed or governing centralized body, but as partakers of the heavenly calling, via the new birth. They are thereby part of the universal (catholic with a small "c") body of Christ. This, in contrast to what developed into Roman Catholicism, and is the true church and always has been....ie....saved people. Acts 2:47 ...and the Lord added daily to the church, them that were being saved. We often marvel at how a system like Roman Catholicism developed. Our contention is that it is the accumulation of small steps over time that caused such a monstrosity to come into being. The adoption of this, then that, and then more things. The elevation of certain men, the ascent of hierarchies, the accommodation of pagan practices, and "christianizing" them. Over time the system came into being. How today do we have practices and steps that could lead to such a system? The increase of the worship band/team/leader system, a defacto kind of clergy in the music ministry that dispenses "worship" to the rest. A priestly worship class is mindful of David's Levites. Their duties were reassigned when the move from a movable tabernacle to permanent temple was being planned. They were a class of singers, under the Jewish system. But to copy this class of "worship leaders" is to return to Judaism. Much of popular charismatic thinking tends this direction, where certain ones are "featured" on the stage - destroying the equal brotherhood. A small step, but Rome's early steps were all small ones too -no doubt. The silence and passivity of brethren in the assembly, waiting for others to take the lead. When the men won't lead, the women will, or it falls into the hands of lesser numbers of aggressive type men, leading to a special class. It is the Diotrophes syndrome. The rise of the clerical class & priesthood. There is always this tendency to let the work fall into the hands of less and less people. And there are those who will take up that mantle with good intentions. In Protestant circles, the strongest vestige (besides them that still practice infant baptism) of Rome is perhaps the one-man pastorate. The biblical pattern is a plural eldership and oversight. The remnant of the one-man rule, just creates a smaller papacy-type system in a single locality instead of at the denominational HQ level. Cultural Accommodation. There is always the pressure to make room for cultural things-to make the church less rigid in the eyes of men of the world. The current rise of women leaders and even preachers in christendom are the kinds of things done for cultural relativity and the demand for "change." Yet these are unbiblical practices, and lead down a pathway.... not a good one. Rome didn't come about in a day. The word of God, holy scripture, is the best resource against the inroad of error.